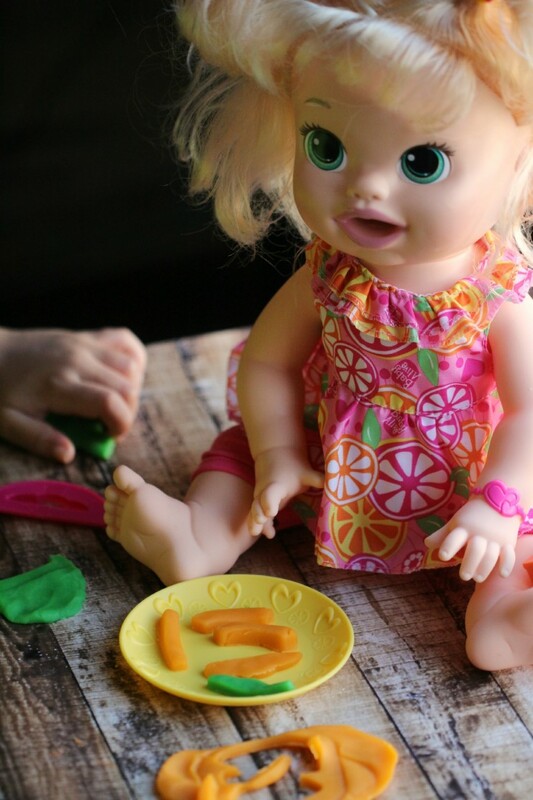 Baby Alive Super Snacks Snackin' Sara Doll #FMEGifts2015 - Frugal Mom Eh! Both my girls, 3 and 1, love dolls, and love babies. They have a collection of babies including a few Baby Alive dolls. They do have a favourite baby who has her own cradle and gets tucked in to sleep, pushed around in a stroller and generally cared for. Some of the babies can eat and expel but since the girls are young, and messy in general, I don’t usually let them play that way. That is what I love about Baby Alive Super Snacks Snackin’ Sara Doll. She is a cute little baby doll who loves to be fed snacks. 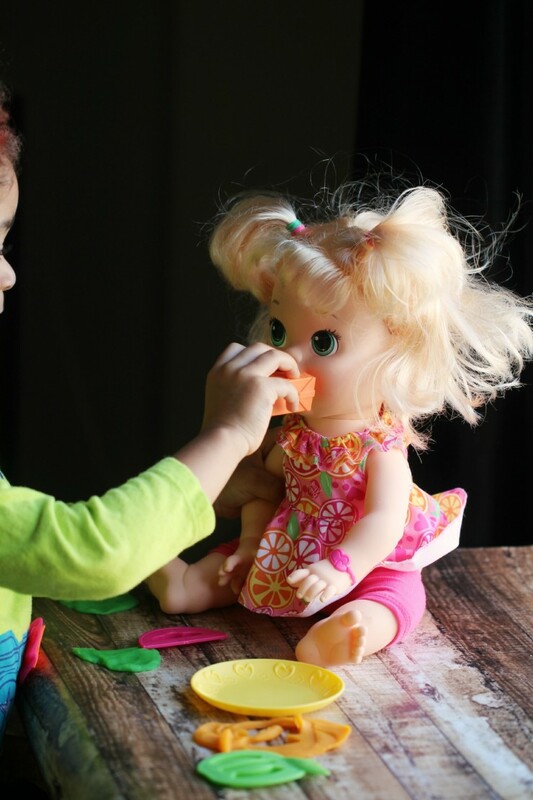 She comes with reusable doll food (play-doh), shaping tools, a plate and a pretend juice box. She also comes with 2 diapers to catch the food she expels but using them is fairly optional. She has made little to no mess, aside from the time my 1 year old smooshed the “food” into her mouth and really packed it in. (This doll is meant for 3+ so this was definitely a parenting issue and not a toy issue.) There is a panel at the back of her head you can unscrew and that makes cleaning up this kind of mess super easy. 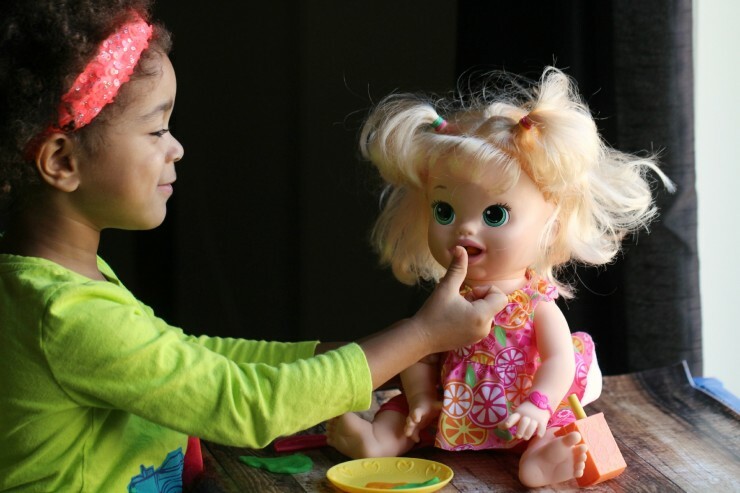 Basically kids can use the shaping tools to make snacks to feed the Snackin’ Sara doll. 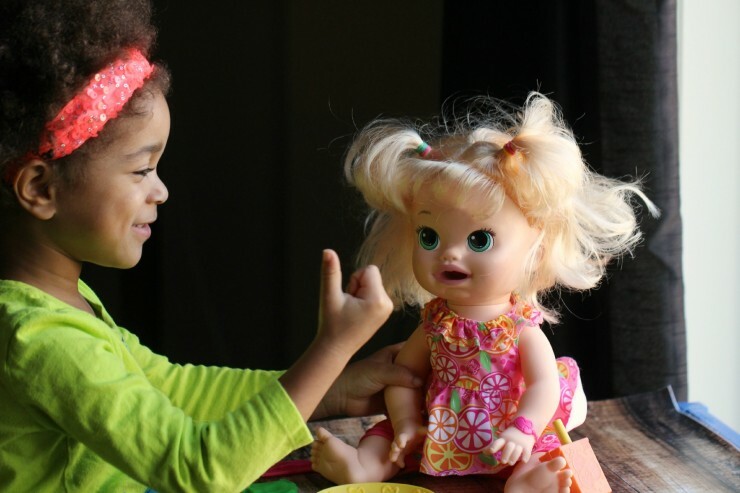 The doll speaks in either English or French (in the USA she speaks Spanish instead of French), and she can say when she is hungry, sleepy or full. My 3 year old has had no issue with shaping the food to the right thickness after I showed her how to do it. 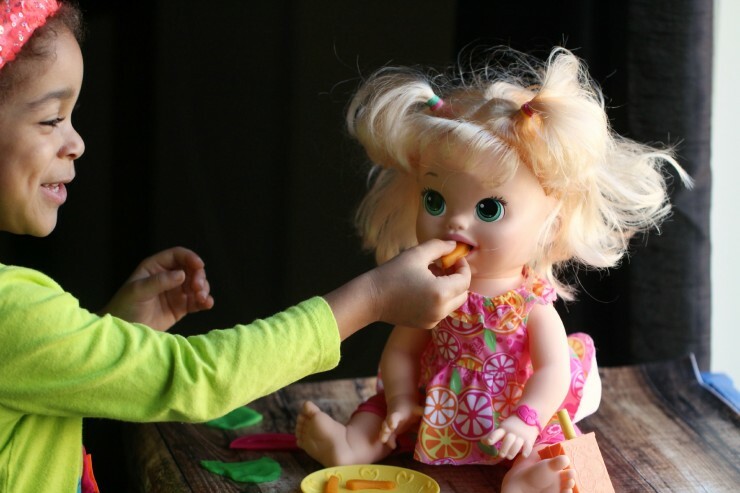 She was trying at first to jam the food in the dolls mouth but that was something else that was easy to correct by simply demonstrating how to carefully put the food in the dolls mouth enough for the doll to eat the food. When she is full you simply remove the diaper which is filled with the previously made food. There is no mess at all inside the doll or in the diaper. The juice box does not get filled with water or pretend juice, she simply “drinks” from the straw when it is placed in her mouth It’s nice and clean play which is great for younger kids. I do usually read Amazon reviews before I finalise my reviews in case I have missed on details or had a different experience so I can test the product again. I noticed many have said their child was scared by the toy (a 6 year old even?!) and that was absolutely not the case in our experience. My 3 year old is afraid of literally everything and she was not frightened by Snackin’ Sara at all. My 1 year old has no fear so her reaction isn’t really an indicator. I mean she thinks its funny to hide in dark rooms and jump out yelling boo. No fear at all. The girls absolutely love Snackin’ Sara though and were actually thrilled by her noises and even more so by her movement right from the start. You can see in the pictures that Keira, my 3 year old, was absolutely excited and happy to be playing with her. They were only put off when I said her name was Sara and they both insisted that no, she was not in fact Auntie Sarah. I guess they have yet to realised that names are not unique. Others also complained that it was messy but as I’ve said, I found this doll to be the cleanest of their eating/expelling action baby dolls. There is no mess for me to clean up when they are done. They simply empty out her bum and put the “food” away in the containers. If the food was ever forgotten it would not be a big deal as it is play-doh; it would simply dry up. It’s no messier than any other play-doh set. She sits up just fine for play and doesn’t fall over or need to be propped up. We also have no problems understanding what she is saying. It is quite clear in both French and English. She does make a mechanical sound when she talks and eats, and it is fairly loud. She is also very childlike in that she doesn’t stop talking until she “goes to sleep”. Once “asleep” you can wake her up by pressing on the bracelet on her wrist to continue playing. I think the best part about her though is that my girls play with her as much as their favourite “baby”. They are constantly rolling out and shaping her snacks and feeding them to her. They love Snackin’ Sara! She does use 3 double “A” batteries which are included (yay!) and seem to last awhile, we’ve had her for about a month now and haven’t had to change them yet. She also comes as a brunette baby and a black baby. You can find Snackin’ Sara in store and online at Toys ‘R Us and Walmart as well as on Amazon. She sure is cute. Baby Alive has been around for a long time and is a guaranteed hit in the gift department. She is a great doll for some, but I agree with some of the others, the doll actually is scary looking to me!! That is such an awesome doll! My daughter would absolutely love her! 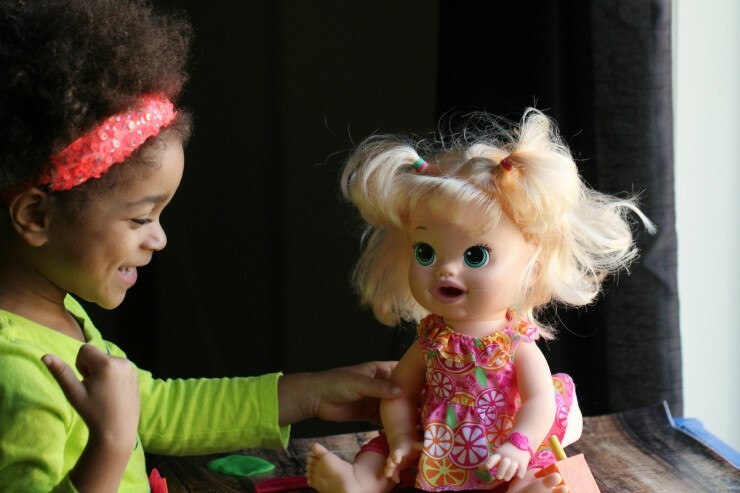 I’ve been looking at the baby alive dolls, but I think this one just shot up to the #1 spot! I think this is so adorable. My kids always loved Baby Alive. Even just maybe two Christmases ago my younger girl asked for the Baby Alive that eats and pees and poops. She thought it was awesome to have to change real diapers. Which is comical because it won’t be fun when she’s changing actual diapers – LOL. 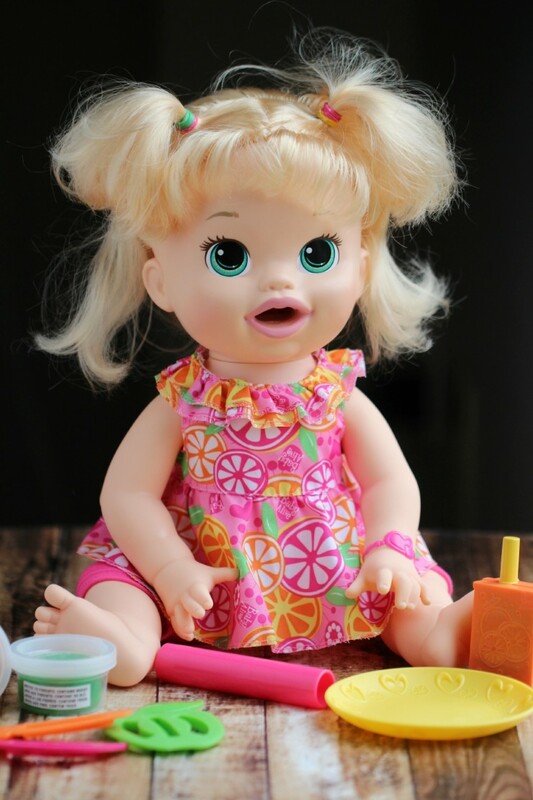 Baby Alive dolls are so cute! I love that she doesn’t make a lot of mess. It’s no fun if you have to constantly monitor how a toy is being used to avoid big messes. I bet my niece would love this! My toddler twins have a few Baby Alive dolls and LOVE them! I may have to add this one to the bunch! Baby Alive has made some great dolls in the past so I wouldn’t expect any different with this one! My daughter would love it, too, I’m sure! That’s so cute! I never had one of those dolls that could eat for reals. I’m going to have to live through my kids’ toys and get one of these. What a fun doll. Kids will love this. I bet kids will love getting to feed their doll. Great gift idea. Wow, I didn’t realize how realistic the doll looked! Too fun! I’m sure this will be on the top of parents Christmas shopping list this year. What a cute doll that is. I love the message it sends to girls that you should only feed your child healthy food and that veggies are not only colorful but tasty and good for you too. My two girls would love this doll! They have a bunch from the Baby Alive line so this would fit in nicely. What a fun looking doll. 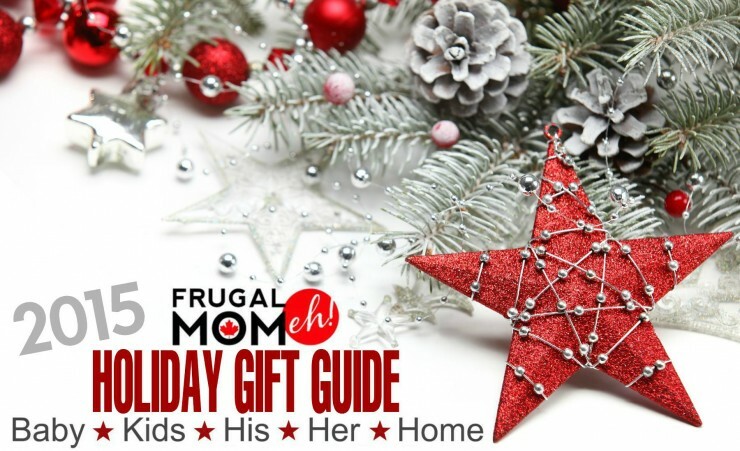 She’d make the perfect gift for any little girl this holiday! This has kid smiles written all over it! What a super fun way to play “little mommy”. 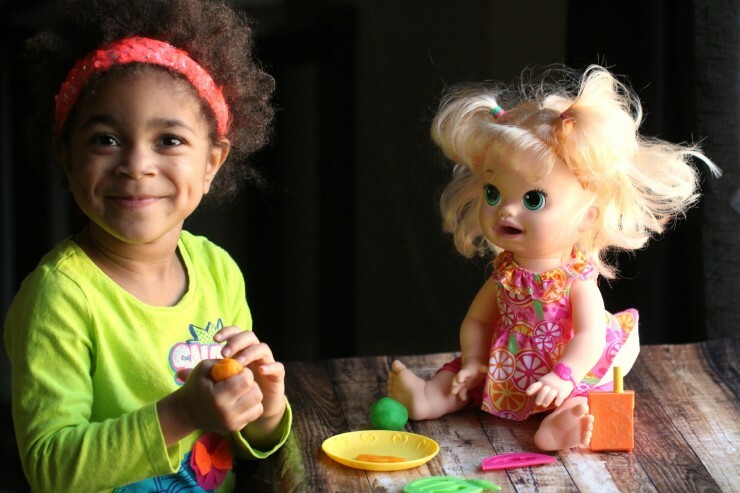 Can you feed real playdough brand to this doll? The doll says to use only the “doll food included” but it’s definitely real play-doh brand as they are both produced by Hasbro. We lost the original “baby food” awhile ago and have been using play doh ever since. If accidentally put liquid into super snackin doll how do you fix the clicking noise it now creates from the bottom mouth roller? Not sure, I would check Hasbro’s website for customer support.